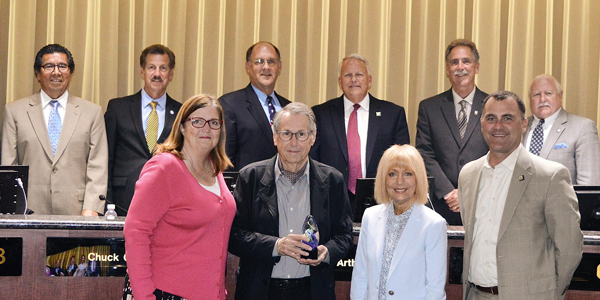 Last week Riverside Mayor Rusty Bailey called upon Arts and Cultural Affairs Manager Margie Haupt to recognize Benoit Malphettes as the city’s Arts Honoree of the Month. A Riverside resident, the French-born photographer who is celebrated for his large format work, followed a childhood dream and permanently moved to America in 1977, eventually becoming a US citizen. Recognized for his meticulous attention to detail and sense of drama, Malphettes gained international recognition with his work. His photography has graced an array of publications including the French & American Vogue, Harper’s Bazaar, W, Glamour and Essence, among others. As his commissions for personal and professional portraits became more and more frequent, Malphettes decided to purchase and revitalize one of America’s most respected portrait studios, Studio Charis of Pasadena. For more than 18 years, the preeminent business and political elite of the West Coast and their families became his clients. Over the years, his signature style and unique vision with an 8”x10” camera became widely recognized and his bold images helped elevate a number of major national advertising campaigns. In 2016, Malphettes created a series of artistic portraits that were featured in the IE Voice’s Merchants of Riverside Project. The portraits, which highlighted some of Riverside’s unique and diverse small business owners, included an exhibit of large-scale fine art prints. The prints were displayed at the Riverside Art Museum during Small Business Week. Since 2007, Malphettes and his wife, Katherine, have devoted their time to personal and community service artistic projects. His exhibition, Impressions of Blue Cut, Ruins/Renewal, was exhibited at the San Bernardino County Museum earlier this year. To learn more about Benoit Malphettes and his work visit https://www.benoitmalphettes.com/.